Exodus Damnation, A popular legal high. After spending years trying to outlaw individual substances deemed to be dangerous, government of the United Kingdom plans to adopt a different approach. Ministers announced they are working on a draft of the law that would prohibit sales of “any substance intended for human use capable of producing psychoactive effects”, with no reference to specific chemical formula. There appears to be bipartisan support for such a decision, since both major political blocks mentioned the measure in their respective manifestos. New law would be known as “The Psychoactive Substances Bill” and would be enforced on the entire territory of the United Kingdom, threatening prison sentences of up to seven years for those who break it. The government believes new legislation will make it easier for the police to cut down on the blossoming trade in novel chemical compounds, while giving the authorities broader powers to search people, premises and vehicles, as well as seize and destroy psychoactive drugs. Special exceptions will be made for chemicals with legitimate medical use, while the ban will not affect products containing alcohol, tobacco and caffeine. Blanket ban is expected to put an end to existence of “head shops” openly selling chemicals which have not been explicitly prohibited and to hinder the ability of UK residents to order “legal highs” from various online stores. 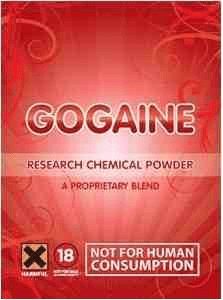 Gogaine, A popular legal high in 2014. New psychoactive drugs have become very popular in Britain lately and have been linked to multiple deaths in the past although in most cases alcohol was the primary contributing factor. UK government previously attempted to expand the list of banned substances to account for new threats (more than 500 substances were added in recent years), but was unable to keep pace with the rapid arrival of new chemicals to the market which was actually caused due to the large demand created by banning ever popular chemicals. Introduction of a blanket ban, similar to laws already in place in Ireland, represents a sharp turn that will eliminate the need to go through the complex administrative process each time a new chemical becomes available. that’s to say: I CANNOT ALTERATE MY MENTAL STATE THRU THE USE OF ANY SUBSTANCE ????? this if folish… this is fascism, not democracy.